Can DSP do 3D well? The atrocious 3d performance of first Mpact led to a major change of Chromatic's design. If their expertise wasn't enough to overcome DSP drawbacks, another approach is needed. Thus the decision was made to implement 3d pipeline in minimalistic yet classical way. New design would feature additional ALU specialized in rasterizing triangles and texturing them. In year 2000 the earth was hit by a giant meteo... just kidding. One year had passed since the launch of Mpact /3000 and Chromatic got second generation ready and this time much better purposed for 3d acceleration. SGS-Thomson joined the band as another manufacturer. Planned clock of 150 MHz was not reached, 125 was used instead. Thus second Mpact accurately doubled peak BOPs of very first Mpact chip, whence the name Mpact R/6000. Chromatic claimed to make the first device capable of sustaining a billion operations per second. Those enhancements are made possible by much improved 0.35-micron manufacturing process. Number of transistors in the chip increased to 3.5 million and consumes 4.5 watts under full load. The most interesting change of Mpact2 regarding 3d is inclusion of a small rasterization pipeline, support for AGP texturing and new instructions. Here is a Nitro DVD by STB, again with chip from LG. Don't mind those heatsinks. Originally STB used quite a big one, but my card arrived without it, so at least I put these little buggers on. Mpact2 can get a bit hot. Also the ugly crystal on the right is my replacement, original one fell off during postage. RDRAM runs at 500 MHz just like with old /3000. I am not aware of any overclocking possibilities. Ramdac speed was increased to 230 MHz. Nitro DVD is very poor when it comes to connectors, if you want to see full multimedia insanity look after Xenon Microsystems card. The design revolves around similar VLIW core capable of issuing one or two instructions packed into a 72 bit word per cycle. The new multimedia processor still features a tight co-design of software and hardware, integrates a second RDRAM channel, enabling a separate 8 kb instruction cache. This means 1125 MB/s peak bandwidth because memory clock did not increase, The chip now with its double clock also doubles memory requests and RAM arbiter combines results from two channels into double sized data through interleaving. Mpact2 has more on-chip memory bandwidth as well. Internal SRAM is expanded to 8 kb with 6 read and 6 write ports. 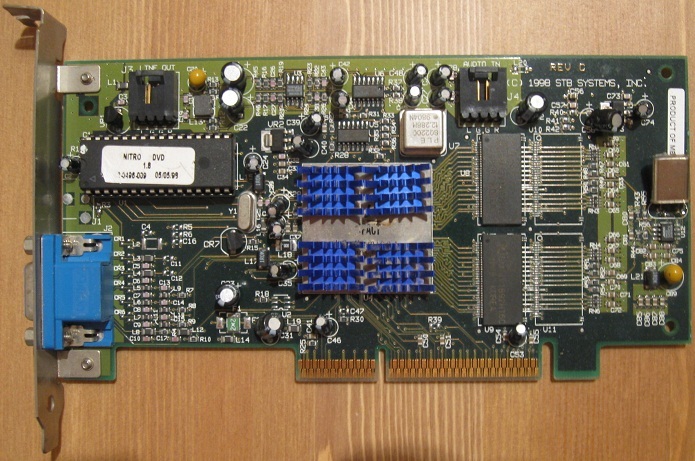 This central memory still has 11 access ports servicing the six functional units, PCI interface, video I/O interface, random peripherals, and Rambus channels. Most important for me is a specialized polygon rendering pipeline for 3D graphics- sixth ALU group of Mpact2. Together with motion estimation specialized unit those two are the only integer ALUs. The graphics unit is a 35-stage pipeline with 2 kb texture cache. Excluding the cache there is only 83000 gates in the pipeline and it does full speed perspective correction, texture transparency testing, texture and fog blending, pixel dithering and alpha threshold. Feature set is complete, but there are other quirks instead. Quality of bilinear filter is among the worst, with obvious color banding left in images, caused by limited amount of interpolating steps between vertices. Mpact2 needs "only" 3 clocks per 3d pixel, thus has theoretical fillrate of 41.6 megapixels/s. This value is true for simplistic scenes, in the real world with filtered textures and blending Mpact2 is glad for half of that. 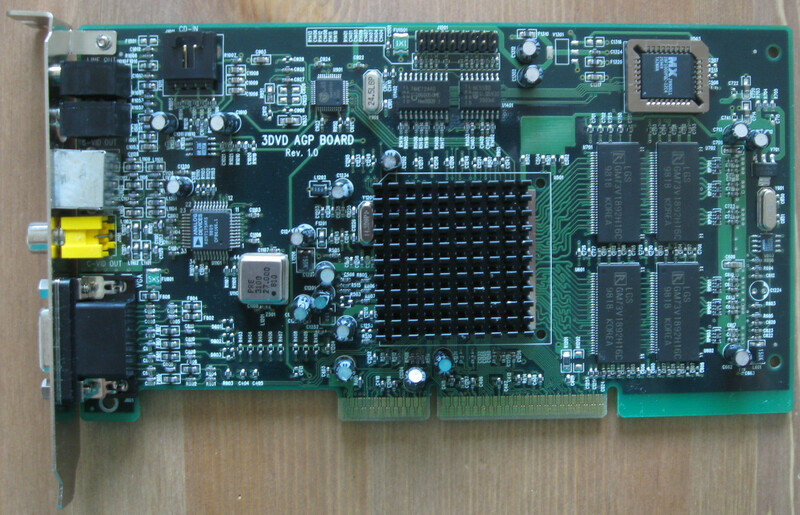 More classy 3DVD card with extensive I/O and 8MB of memory. Click on the image to see the difference after setting highest quality. Visit whole gallery. The 8MB card avoided such problems except two games. 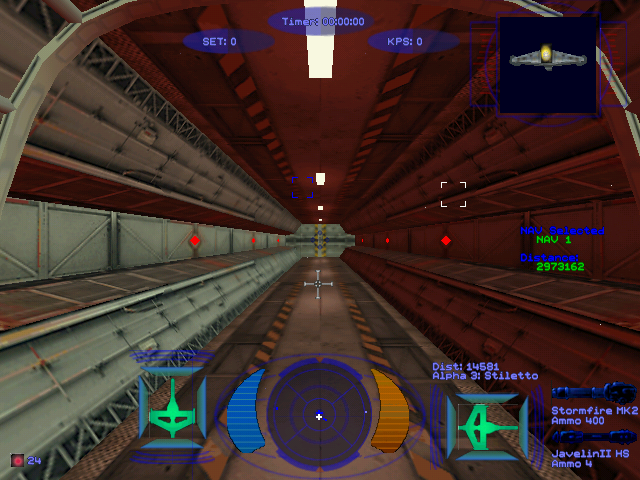 Ground texture in Mechwarrior 2 switches to lowest mip level at first transition. Viper Racing suffers a lot, the LOD level is completely off, blurring track objects and fence into oblivion. Turning mip-mapping off makes Viper Racing look lot better. And then there is a wrapper for GlQuake and Quake 2, but it is a beta with issues. Games based on first Quake engine run quite slow, and sometime there are random lines and dots appearing. Quake 2 was up to expectations, Quake 3 worked only via d3d wrapper. Last driver brought updated version that speed up Quake 2 nicely, but broke compatibility with Quake 3 and Sin. What's more, it is not stable enough with 4MB card. 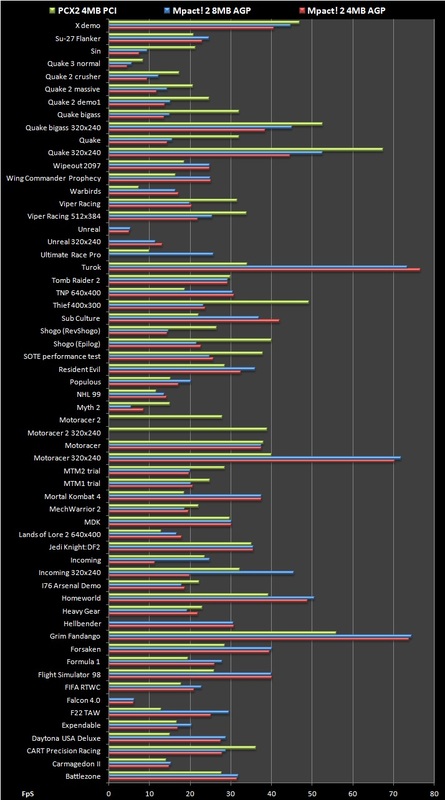 Here are average framerates, click on image to see minimal ones. PowerVR's PCX2 is worthy contender. It exceeds Mpact 2 4MB in average framerates by 20% and matches it in minimal. Board with 8 MB of memory sits in between. Feature rich Mpact! 2 however produces nicer images in almost every game. Overall the speed is not tragic by far, but also in significant distance from top dogs of 1997. Mpact failed to sell well as a graphics card, but was it faulty concept, wrong execution or bad luck? Many "what if" thoughts complicate such judgements. The whole business model of selling IC design to semiconductor manufacturers did not guarantee much profit for Chromatic. As they could not sign a foundry partner things were getting even more gloomy for planned CPU. Another difficulty was the burden of coding all the Mediaware modules required by the different market targets. The company was not able to interest its customers to cooperate on software development, nor create enough revenue to cover its development cost. 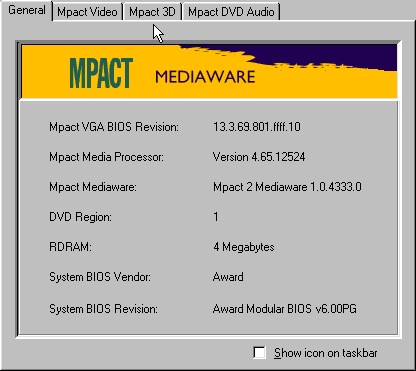 The whole software layer of Mpact was reaching operating system complexity, but also shielded all multimedia features behind single IRQ, greatly enhancing stability. You really did not want to have all the drivers of special devices fighting at Ring 0 of Windows 9x and for PCI bus. First Mpact had little to offer as a 3d card and some dedicated hardware clearly became necessary to cover new trends. There were many reasons for the demise of the company, however, primarily the lack of interest from PC makers made it impossible for Chromatic to sustain its overhead. Although Mpact delivered great 2d graphics performance, state of the art audio capabilities and ultimate DVD playback, so it settles for the inferior 3d experience as fatal. Should have Chromatic fed their gamers via web with actually useful driver updates, maybe gamers could have been more patient and spread some good word about Mpact2. After all, as you can see it can perform reasonably well in 3d. Being best in DVD alone did not sell enough. Consumers accepted cost of special purpose 3d accelerators, CPU vendors boosted their multimedia performance by adding SIMD support, and other graphics vendors assisted DVD playback enough to compete with special purpose decoders. Chromatic Research was known for relatively large number of employees peaking around 350. Of note is the fact that it went through more than 5 rounds of funding. 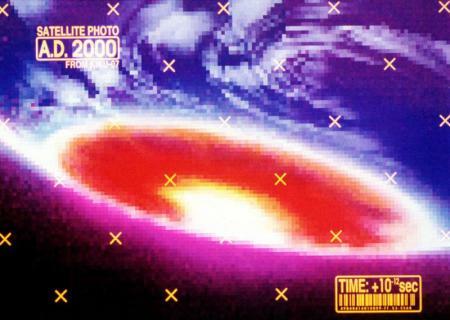 In July 1998 Chromatic announced end of Mpact 3 development and change of focus to a new vaguely described product. The company laid off half of the employees and was heading to bankruptcy. In October ATi decided to buy struggling Chromatic for $67 million and absorbed them by the end of the year. This meant premature end of driver support because ATi could not be bothered to offer any help. Around the same time heavyweights like Samsung and Phillips also gave up on their PC media processors. 3d acceleration was to be done by specialized hardware only.